Love it, this is exactly what I’ve been looking at for a project. The project requires Visual Studio 2010 with SP1 and IIS Express. Also make sure that you have the latest version of nuget installed. Let me know if you continue to have troubles. I have visual studio 2010. BUt i have basic version of windows 7. i am not able to intall IIS. For this example, you do not need IIS. You can just run IIS Express locally to get it running. Obviously if you plan on hosting it for others, you’ll need to do so with Windows Server. Thanks a lot for your useful widget. I have a problem with it. Every time I load index (Home/index) page, after getting data from google, it shows statics but it goes away and comes again in page, some kind of flashing, then it disappears. I’m getting a 404 error on the Auth method for the url https://www.google.com/analytics/feeds/. Has anything changed with the google api? It seems like Google had changed the API End Points and etc. 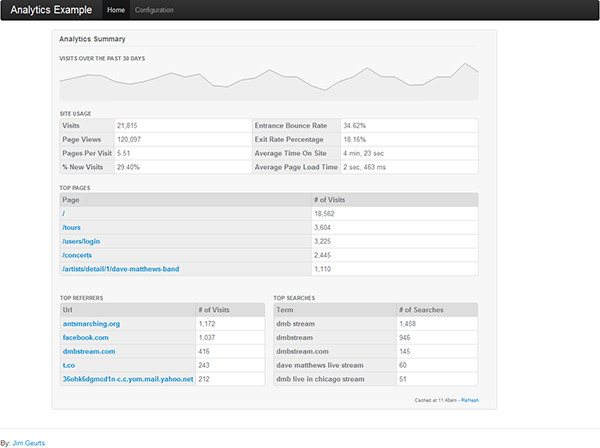 Anyone have examples of how I implement Google Analytics in native ASP? The Google Analytics is the feature that provide the facility to get the statics of the website. In the google analytics statics get by the help of reports. The report show in the account show very easily but when show the data in the program then it creates problem. So, let’s know about data in google analytics. Reports are generally organize into these categories: users, traffic sources, content, internal site search, goals, and ecommerce. Generally, the data report is based on the dimensions and metrics. Analytics reports use a combination of metrics and dimensions to describe key types of user activity to your website, such as which search engine users used to reach your site in the Search Engines report, or which pages on your site received the most traffic in the Top Content report. Similarly, the Core Reporting API groups both dimensions and metrics into several categories of report data. By choosing your own combinations of dimensions and metrics, you can create a customized report tailored to your specifications. 1. Set up the tracking code in the web. 2. First Create service account in the Google Developers Console. 3. Add permission for this account in the Google analytics. Second install the necessary api’s that connect the google analytics. I was so happy to find this example, only to see that google has deprecated your code. Any thoughts on updating the example with Google’s new libraries so it works?